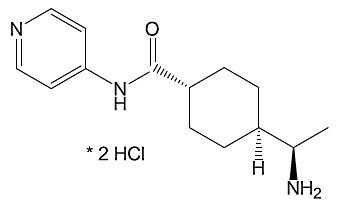 Y-27632 Dihydrochloride CAS #129830-38-2 is an ATP-competitive inhibitor of ROCKs including pl60ROCK (Ki = 140nM) and ROCK-11 (IC50 = 800 nM). At a concentration of 10µM, Y-27632 blocks apoptosis of dissociated cultured human embryonic stem cells, increasing cloning efficiency by 25% and sustaining survival up to 30 passages. Manufactured to meet an ultra-pure standard greater than 99%.